Olympic boxer Fred Evans has been given a suspended jail term after punching a friend - despite a judge saying he "deserved" prison. Evans, 24, of Cardiff, admitted unlawfully wounding Michael Wilson at a Gloucestershire pub, breaking his jaw. He is the current Olympic silver medal holder at welterweight, after ending as runner-up at the London 2012 Olympics. He was given a two-year sentence, suspended for two years, at Gloucester Crown Court on Thursday. Judge Jamie Tabor QC gave Evans the sentence after hearing a custodial term would be "devastating" for his career. The judge described the offence, in October 2014, as an "enigma". Addressing Evans, he said: "Why on earth you lost your self-control and punched your good friend, breaking his jaw, seems impossible to unravel. "There must have been an undercurrent in your relationship with Michael Wilson which you and he are not saying anything about. "To get where you have in the boxing world, you must have shown great dedication, self-discipline and self-control. "But there is no excuse for what you did and you richly deserve a prison sentence - but I feel able to suspend that sentence." Evans, who is training for next year's Rio Games, struck Mr Wilson, of Ledbury, Herefordshire, when they were out together at the Inn, in Redmarley, near Newent, Gloucestershire. The attack put Mr Wilson in hospital for four days with a broken jaw. 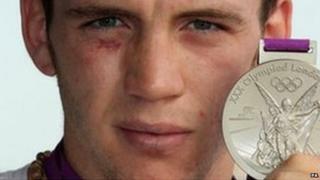 The boxer's coach, Nigel Davis, made an impassioned plea for him to be spared a jail term. He told the court: "I met him at the gym in Port Talbot when he was only four. It was near a travellers' site and it is well known that travellers use bare-knuckle fighting to settle disputes. "But the moment I saw Fred box I could not believe what I saw - the kid was so special and I realised then he could become a world champion."